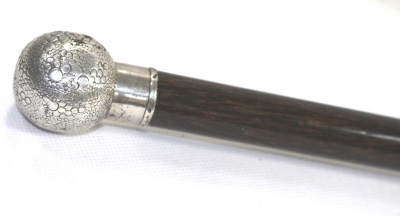 Unusual, very smart silver pommel Deco style silver pommel mounted Palmira hardwood shaft, with base metal shaft. The pommel holding Assay marks but too rubbed to determine Assay House and date letter. Very good condition with relevant wear for age with few minor silver dings. No breaks or splits.